Categories > The Open Forum > Who's Who > Harry Lorayne's JAW DROPPERS! 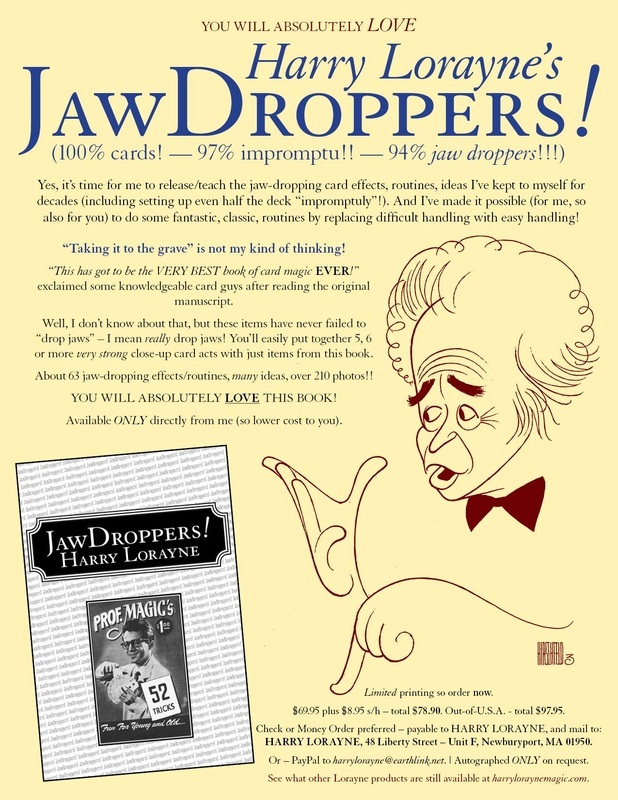 I am very close to ordering a copy of Harry Lorayne's Jaw Droppers. I would enjoy hearing from others who own the book. Looks great! Sounds like your daughter liked it too!! Oh, and if you find the piece of video from I've Got A Secret TV show - that was my first national TV appearance - 1956 or 1957. Quite a difference from my appearances years after that. Somewhere on youtube (is that the word?) there's a piece of me on The Tonight Show with Johnny Carson - quite a difference. I have no idea how to find it, and if I did, how to post it into this forum. Harry, I was friends with Bob Elliott, what a great guy. He told me a funny story about the making of that infomercial, had to do with you and a wireless mike? I am very close to ordering a copy of Harry Lorayne's Jaw Droppers. I would enjoy hearing from others who own the book. Any favorite effects? I'd be curious to know how you became friends with Bob Elliott. I bet that's an interesting story. Four Second Wonder clocks in at 25 seconds........Hmmmm. I need to get this book. I love card magic like this. Bob Elliott used to set up lectures for people and one day he called asking if we (Springfield, MA) were interested in having Paul Harris. After PH came an went Bob called to say he'd be at a local convention, so we met there in CT and I got to meet his wife Happy, also. I still hear from her once in a while. Bob was really funny, big personality, and had a million stories to tell. As it says at bottom of the ad (in all my ads) "Autographed only on request." Many years ago I would autograph every book ordered directly from me; ego I guess - until I received a postcard with three words on it - WHO ASKED YOU?! I finally realized that some want "clean" copies of books. So, I'm happy to autograph any of my books for/to anyone who asks me to do so. Bob Elliott was a close friend. He was one of my instructors when I ran the Harry Lorayne Memory Course at the Algonquin and Roosevelt Hotels in New York City. He would "watch" my townhouse in the West Village every summer when we were in Europe for a month or two. He was a close friend; I miss him. EVILDAN: Called "Four-Second Wonder" because it's my takeoff on Gary Oullette's "Three-Second Wonder" which I published in APOCALYPSE, or somewhere. And yes, if you love card magic at all, you NEED this book. What are you waiting for?! Oh, and I'll be happy to autograph it for/to you - IF you request that I do so. I just ordered. I don't think I've been this excited for a book in a while! harrylorayne@earthlink.net . Best - HL. Wow, thanks Harry. It should be under the name Chi Han Yeo, but I have a feeling paypal might take a while to process, it says it might take 3-5 days. I included a message in the paypal part. If it doesn't show up by then I'll shoot you an email with the receipt details! Okay, just saw your order ScreenguardGuy. Yes; it's a different kind of payment thing - one that I'm not familiar with - and PayPal says that it may not "come through" until about Feb. 3rd. No problem - and I saw your message - be happy to do it for you. Best - HL. Oh excellent! I'll post a review when I get through it, and if it's terrible feel free to use it in an ad a la the Penguin marketing strategy (although I have a feeling it's going to get 5 stars). Yeah, of course, can't overlook the "Penguin marketing strategy"!! Don't know whether to continue holding aside a copy of JAW DROPPERS! for Whodini! I ordered a copy of jaw droppers! recently, based on the recommendation of Bob Elliott almost 30 years ago. After seeing some stuff demonstrated at a local magic shop I bought a book by paul harris and was having difficulty working out the instructions so I asked Bob for help. He looked over the trick and began to shake his head. It required moves that had no description. Bob had a a lot to say to me about jumping ahead of him and wasting my money. That most magicians aren't writers and take for granted the reader would have all the knowledge required to do the trick they describe. Not giving all the necessary explanation of sleights involved or just putting garbage in print to fill pages. Then he added "except by Harry Lorayne" Harry was by far the best teacher in print because he selects on the highest quality material and his writing takes nothing for granted. You'll be happy with any book by Harry. Bob Elliott was an amateur magician and he amused me greatly by often stating a great put down when people bragged about being professional magicians. He used to say, "The Titanic was built by professionals"
Bob Elliott really respected Harry a lot. haha! I remember the first time i heard that line! Bob was teaching me dingles version of the cigarette through quarter when a a man began to chastise him for sharing the method with a kid, whom he felt did not have the experience to handle such knowledge without exposing it. and they got into an argument of whether or not amateurs should be taught professional sleight of hand. I don't remember what the guy said to him, something along the lines that because he was paid to do magic at a local restaurant that he earned the right to better magic than those who did not so Bob suggested they both do some magic for the customers and see who they thought the better magician was. He declined saying Bob was well know there and it wouldn't be fair. Bob then offered me up as his opponent but the professional said he only works for money but Bob wasn't letting him off the hook, If the professional won bob would pay his performance fee but if i won the magician would pay me double that. Cooler heads were trying to stop this, because it was a lot of money but bob was adamant. he asked the owner to get his wife, happy on the phone to bring the money down when the magician bowed out, luckily because if he lost 125 dollars betting on me I would have felt terrible. I hope I'm not talking out of school here. I never met Bob Elliott but I heard a lot of stories along those lines about him. It seems that if he liked you there is nothing he wouldn't do for you. He really was a great guy. I only knew him for a couple of years but he was one of the most honorable men I'd ever known. As a mentor/teacher he made you believe you were capable of accomplishing anything you needed too. If you just wanted something the outcome wasn't so certain. Watching him do magic was something else. He was really good. He had a set of lecture notes titled "I only steal from the best!" he did, there was some great material in there. Can't wait to go through Jaw Droppers! and see what Bob would have appropriated from this book. Bob helped a lot of new guys get started by getting them a lot of lectures booked. If Bob called and said you gotta see this guy, it was a great booking. Bob was a very close friend. He was my first instructor of my memory-training classes in NYC. He demonstrated my systems for me at every first lesson - potential students called off numbers rapidly, I wrote them left to right on the blackboard - about 25 digits. Bob would then reel them off left to right - I'd say "Do it backwards," and he did, no hesitation. He was my townhouse sitter every summer when my wife and I went to Europe for a month or more. I'll miss him always. I love that Bob Elliott is the subject of so much chatter in this thread, especially the story about him challenging the pro. I never knew him to be cocky, but I can see him doing what he did in that situation. He was as generous in spirit as they come. And I always knew him to share anything magic that you would want to know. Like Harry, all Bob cared about was making sure he taught it right...and that you got it. I never saw him turn away to make sure you couldn't see what he was showing someone else. He was the guy who first showed me Spellbound, Vernon's Cutting The Aces, and Triumph...one right after the other some 25 years ago at Tannen's. I'm still fried from the experience even though I immediately learned all three. I don't know if you're still around the forum but if you haven't gotten a copy of this book you absolutely should. It's been about 20 years since I've immersed myself in one of Harry's other books so I don't know how to rank it against them but I love it. If the cost is a big consideration he price has certainly gone up from the "old days" but not as much as it seems when you take inflation into account. I've never paid this much for a book on anything, let alone magic and I think it was worth every dollar. As far as quality of material goes, I'm not a professional magician but I think it's phenomenal. I've got my favorite effects but they keep changing as I work through the book. If you're into "new school" magic and worried about the material not being for you, don't. This is hard hitting stuff. There are a number of quick very visual effects along with longer routines in the book. I think it's one the most clearly written book I've read. I cannot stress this enough, even without cards in hand I've been able to visualize every single routine I've read from this book as I read them. I have a lot of my mind these days and easily distracted by more pressing matters,as a result my comprehension is slower than it should be but every time I open it and run through an effect I grasp it immediately. Harry said he has been streamlining/simplifying his methods/handling over the last decade and the cleverness will often delight you. For example, I started work on the card sharp & the four gamblers today from Reputation Makers in the classic collection v2. It was more than I could get a handle on atm. I went to the version in Jaw Droppers and within 15 minutes I understood what needed to be done to accomplish the routine. Jaw Droppers put something that was out of my reach, within my grasp and I'm grateful. I don't think I'm speaking out of school here, it's in the advertising. I was not sure Mr. Lorayne could add anything important to his canon of works, but he has. Jawdroppers is well worth owning, even if you already have many of his earlier books. I am currently on vacation and have had the time to spend finish reading Jaw Droppers. I have worked through many of the effects with cards (very warped by humidity here in Florida) in hand. This book is simply the best book on magic I have read in years. There are so many things I will use and just have fun playing around with here. Thanks again, Harry for continuing to write wonderful and amazing literature for our obsessive little community. I am now just beginning Special Effects... probably absorb it in about three days. If anyone is on the fence about Jaw Droppers, you will wonder why you waited once you have it! I completely agree with thefritz. By the way, Harry said that he's almost out of copies, so I'd encourage you to get a copy before it's too late. Harry, after months of foot-dragging I finally ordered my copy this afternoon along with a request for an autograph. (what was I waiting for?!) Looking forward to receiving it and digging in with cards in hand. I found an effect in Jaw Droppers that I changed a bit to fit my personality as I’m different from Harry in how we present magic. Much of my magic is Perverse Magic and I’m going to post this on the Perverse Magic thread of the Genii Forum on September 1. It’s already one of my favorite effects. The effect is "Aces Are Good; Jacks Are Better". Jerry gave me a preview of his version of Harry's trick from JawDroppers and it's really fun! I'll make a little video of me demonstrating it for you. By any chance, is anyone willing to let their book to go, I'm willing to buy one!